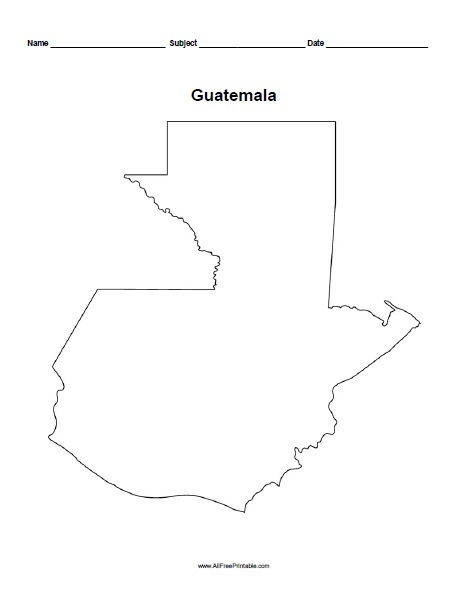 Free Printable Guatemala Outline Map. Free Printable Guatemala Outline Map that can be useful for school or homeschooling. Print it free using your inkjet or laser printer and share with your students at classroom. Use this map to give a test, coloring page, project, to study for a test, short quiz or for homework. Includes space for student’s name, subject and date. This map includes the Guatemala Outline Map only without divisions where students can identify the Guatemala regions, oceans, areas and territories. Print all Guatemala Maps here. Click the link below to download or print the free Guatemala Outline Map now in PDF format.